Gleaston Castle is a gem of a site; a little known and poorly understood courtyard or enclosure castle, located in the beautiful Furness Peninsula. The history of the site is scant and whilst it has been the subject of antiquarian and more recent documentary research, its origins and reason for construction still remain unclear. 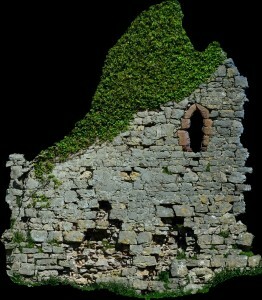 Some writers have proposed that the castle was constructed in the early 14th century as a response to the Scottish raids, although the site is not mentioned in documentary sources until some 30 years after these raids and may simply be a reflection of the wealth and status of the Lord of the Manor. Today the site survives as the ruins of three towers with an associated curtain wall. 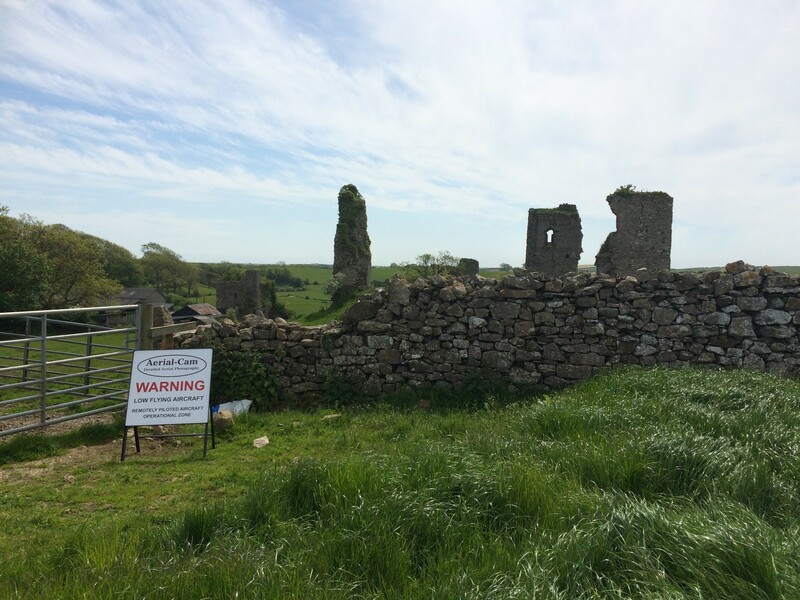 As a Grade I listed building and Scheduled Monument this unique site is protected from development or destruction, however, this site is currently on the Heritage at Risk register with many conservation concerns. Its crumbling stature is not new, the site is believed to have been dismantled after it ceased to be a manorial residence. It was described as a ruin in the mid-16th century and is depicted as such in engravings from the early 18th century. Whilst the site was subject to antiquarian attention, with plans and descriptions produced in the early 19th century, I was surprised to discover that the site had never been fully recorded, in particular the elevations of the structures which survive from its original layout. 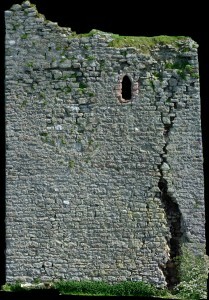 To bridge this gap in the archaeological record and gain a better understanding of the site, Morecambe Bay Partnership applied to the Castle Studies Trust for a grant in late 2014. I was thrilled and delighted to hear the news that our application had been accepted and a generous £5,000 grant had been awarded to enable an aerial photographic survey and 3D model of the site to be produced. In addition, the grant would fund the production of a conservation assessment, outlining the historical background and current issues for the site. 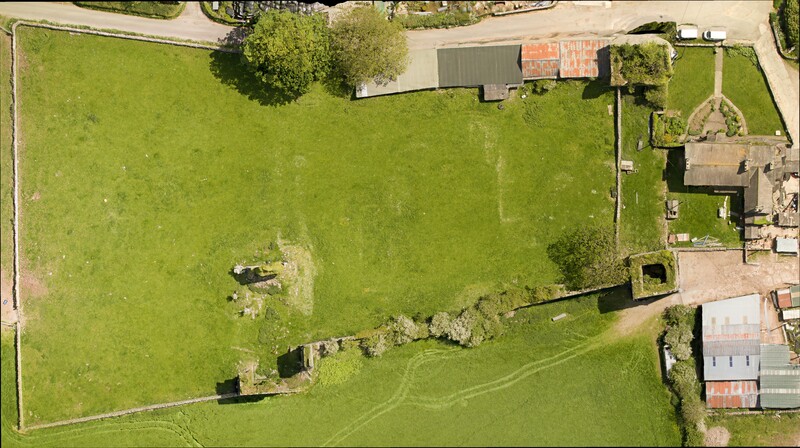 Greenlane Archaeology Ltd. was commissioned to run the project, bringing in professional archaeological photographer Adam Stanford from Aerial-Cam to undertake the survey work. 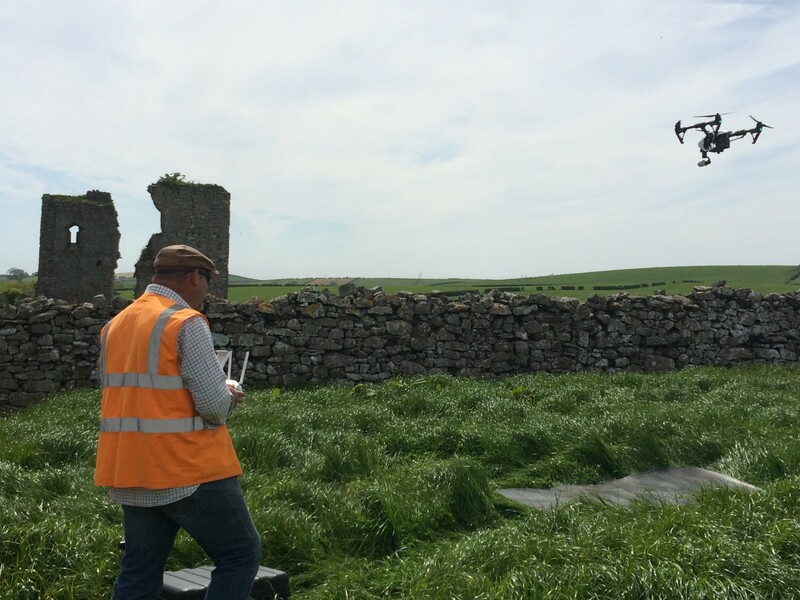 During the summer of 2015 Adam flew over the site with Remotely Piloted Aircraft (RPA)-a DJI Inspire 1 quadracopter fitted with an X3 gimballed camera producing still images at 12 megapixels. Professional photographers, such as Adam, have to follow strict guidance and regulations as part of their licence to undertake such work. The photographic record from the air was supplemented by high-resolution (24 megapixel) images captured with a high-level telescopic pole and more traditional ground-based photography to obtain close up images of the structure. Over 600 overlapping photographic images were taken to capture a detailed record of the site. Back in the office Adam used Agisoft Photoscan to process the data collected. The results were stunning, including aerial images and the creation of a 3D model, which enables the site to be ‘explored’ from the safety and comfort of a PC or tablet through Sketchfab. 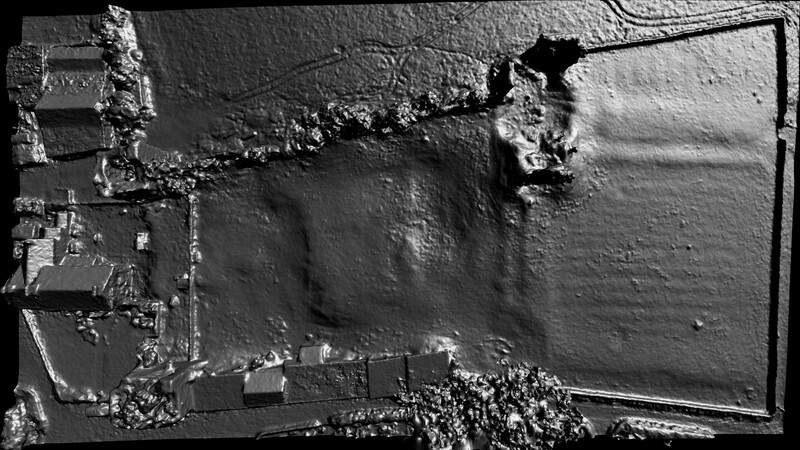 One of the most important outcomes of this project was the detailed orthophotos that were captured of the elevations of the castle’s ruins. 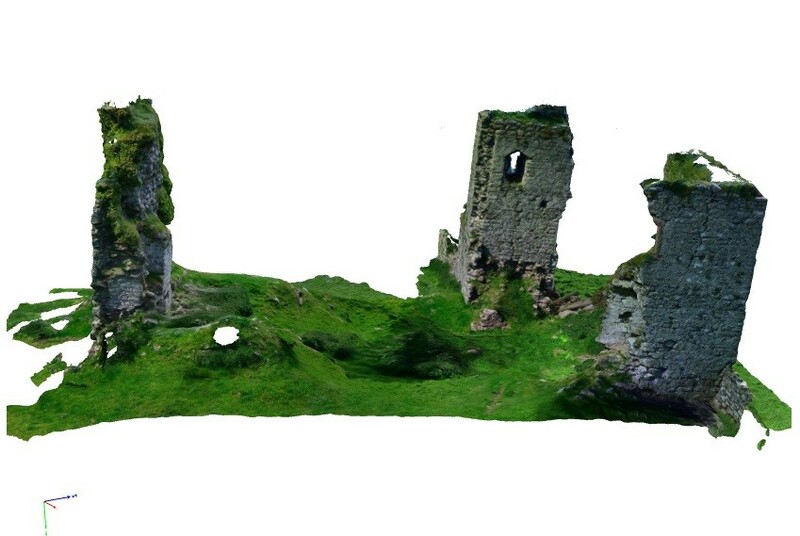 We have been using these images to inspect the construction and conservation issues for the site, but primarily they form a permanent record of the castle that was lacking until this survey in 2015. The aerial image and subsequent grey scale shading was particularly informative revealing furrows and a possible track way to the north-east of the castle. The track appears to lead to the north-western tower, the largest structure at the site and probably once the manorial residence. Within the curtain walls, areas of terracing and possible building platforms could be identified – but what could they be? Supplementing the photographic work Greenlane Archaeology also undertook a topographic survey of the site to complement and enhance the results obtained. 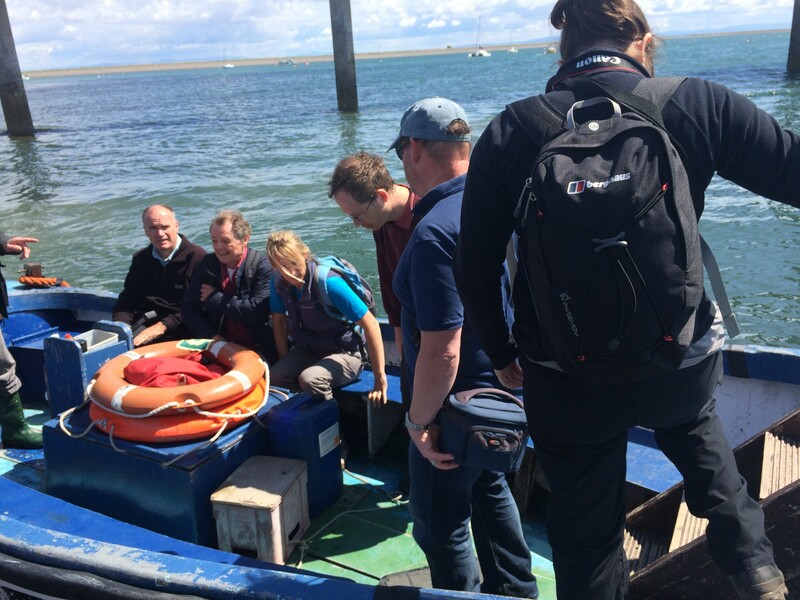 In August 2015 we were delighted to host some of the trustee’s from the Castle Studies Trust (CST) along with supporters of the CST charity, who travelled to the Furness Peninsula to see the survey work in action. We were joined by the Historic England Heritage at Risk Officer, the Lead Archaeologist from Cumbria County Council, and Helen Evans who had compiled the Conservation Statement. Adam from Aerial-Cam gave a detailed demonstration on how the RPA captures the photographic images and how these are enhanced and combined to form the incredible 3D records of the site. 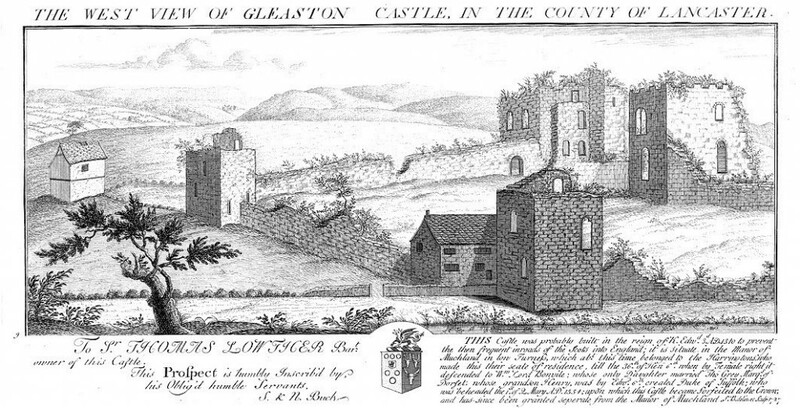 To put the site of Gleaston into context, the visitors were also taken on a tour of Piel Castle, which can be seen from the elevated position of the north-west tower at Gleaston. Piel Castle is positioned on a tidal island and we had to use the local ferry service to reach the site. It was some months later, during discussions with Dr Richard Peterson and Dr James Morris of University of Central Lancashire (UCLan) Archaeology and Anthropology Department that the next piece of fieldwork was being determined. 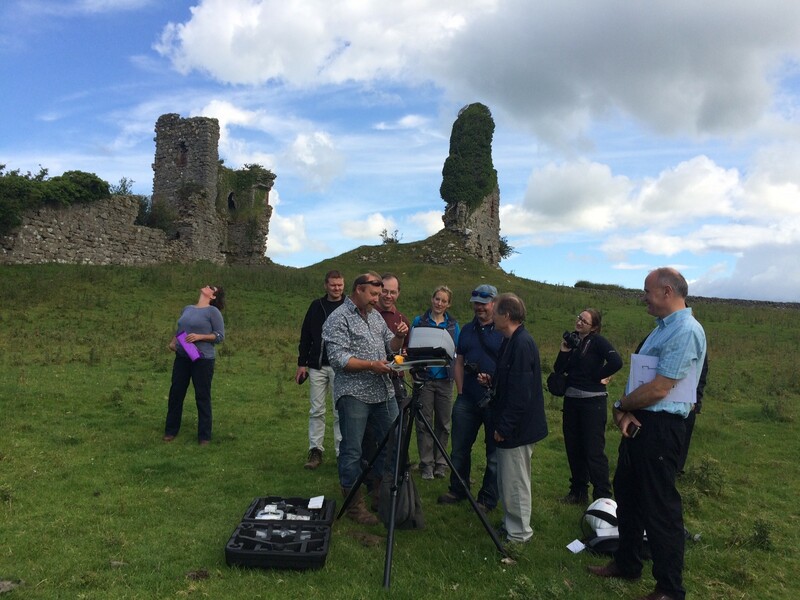 Each year UCLan host a field school for their first year archaeology students and the team were looking for a site to use to teach the concepts and theories of geophysical survey and laser scanning. We had some interesting research questions to answer, which had been formulated following the photographic survey – do any buildings survive within the courtyard formed by curtain wall and what are the features shown to the north of the castle? Together we thought that Gleason was the ideal site for this year’s field school. Before any plans to be laid out we had to get permission from the landowners to allow this work to go ahead. Once this had been secured, we had to apply to Historic England for a Section 42 licence, as the site is Scheduled and such work is strictly monitored by Historic England inspectors. Permission was granted for the work and the fieldwork was scheduled for the end of April 2016. In addition to UCLan students, the survey training was opened up to the community, with fifteen places available per day through the Heritage Lottery Funded Headlands to Headspace (H2H) Landscape Partnership Scheme, which I am currently running part of for Morecambe Bay Partnership. 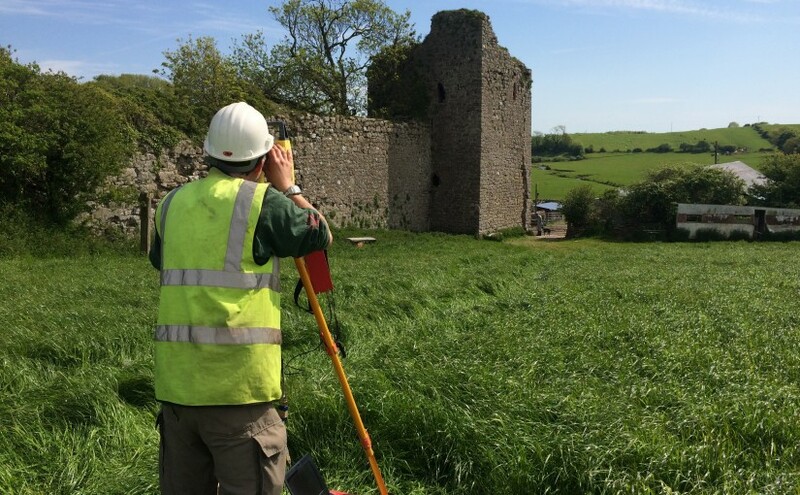 On 25th April we started the work at the site, using earth resistance and magnetometry to survey areas within the curtain wall and to the north of the castle, where we had identified ridge and furrow and the track way. The training attracted participants from as far afield as Liverpool and Carlisle as well as some local residents to Gleaston Village. The north-west tower was also subject to detailed laser scanning, which will supplement the photographic record produced by Aerial-Cam. The weather was, well, challenging especially for the end of April with heavy downpours and even snow hampering our progress on site! 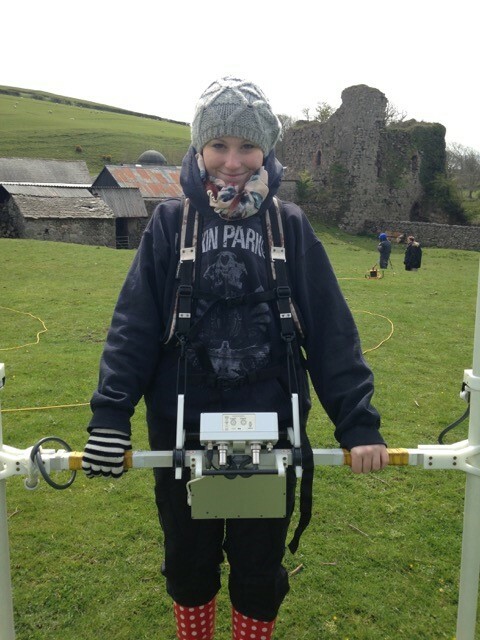 One of the first year students from UCLan undertaking a magnetometry survey. Still smiling despite the cold! The team of students, together with volunteers and the fabulous UCLan staff persevered and we completed a significant amount of survey across the site. 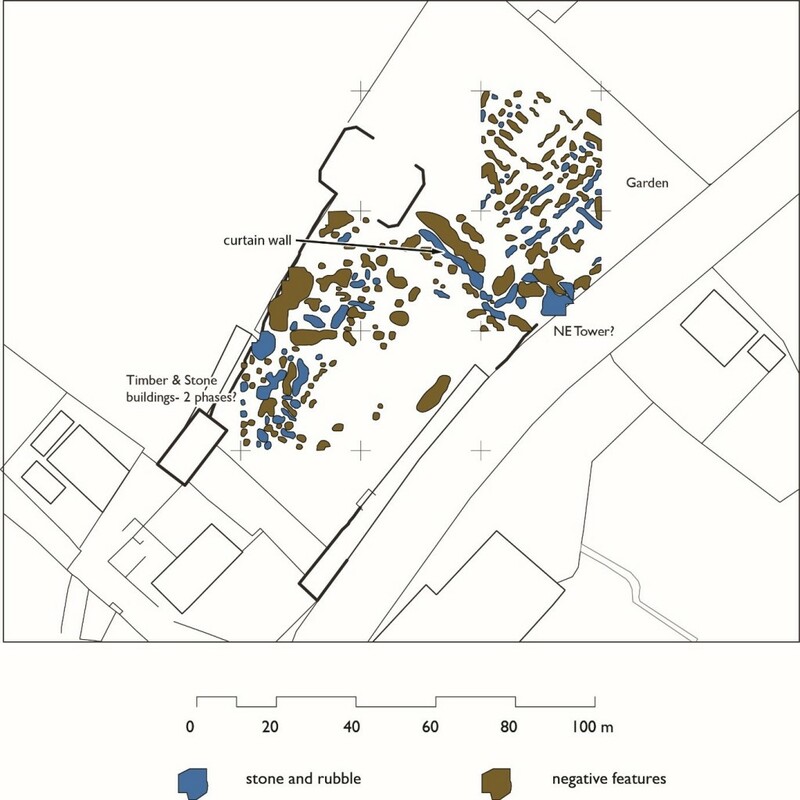 The results of the survey work are currently being processed by the team at UCLan, however, initial interpretation of the data is highlighting garden features to the north of the site and possible post-built structures to the south-west of the courtyard. 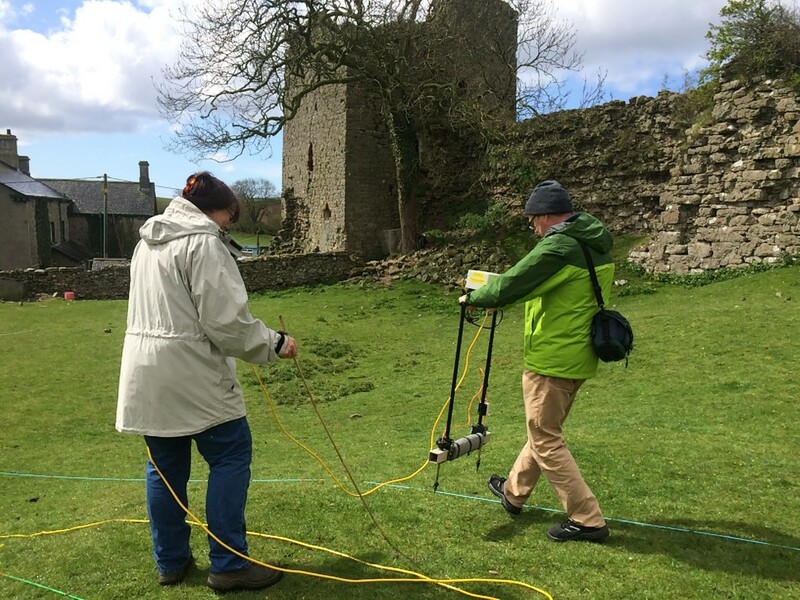 Interpreted results of geophysical survey at Gleaston Castle by Richard Peterson of UCLan. Base mapping contains OS data © Crown Copyright and Database right 2015. An EDINA/Digimap supplied service. All this recent work is enabling professionals to gain a better understanding of the site. For the first time we have an accurate photographic record of all the standing remains and have started investigating what below-ground remains may survive beneath the soil. 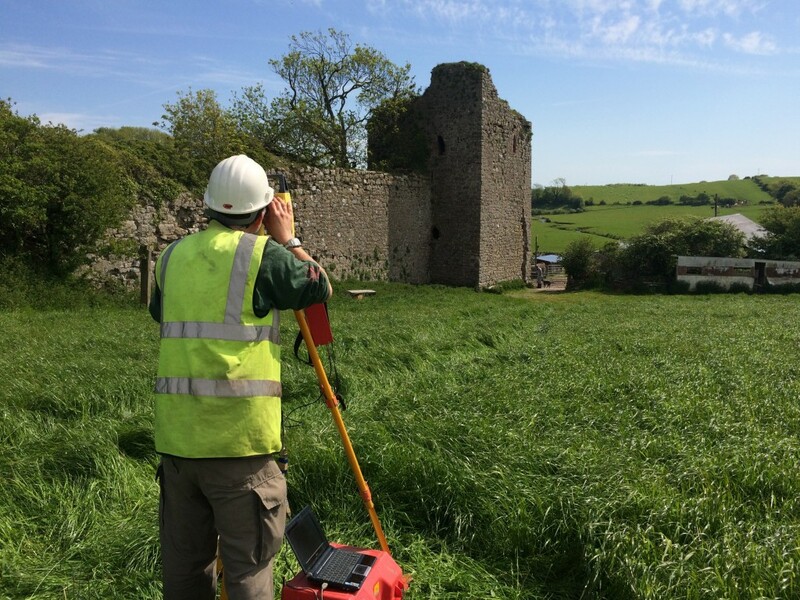 Morecambe Bay Partnership would like to thank the Castle Studies Trust and all their supporters for enabling the survey work to take place and highlight the importance of this site and the conservation issues the site currently faces. 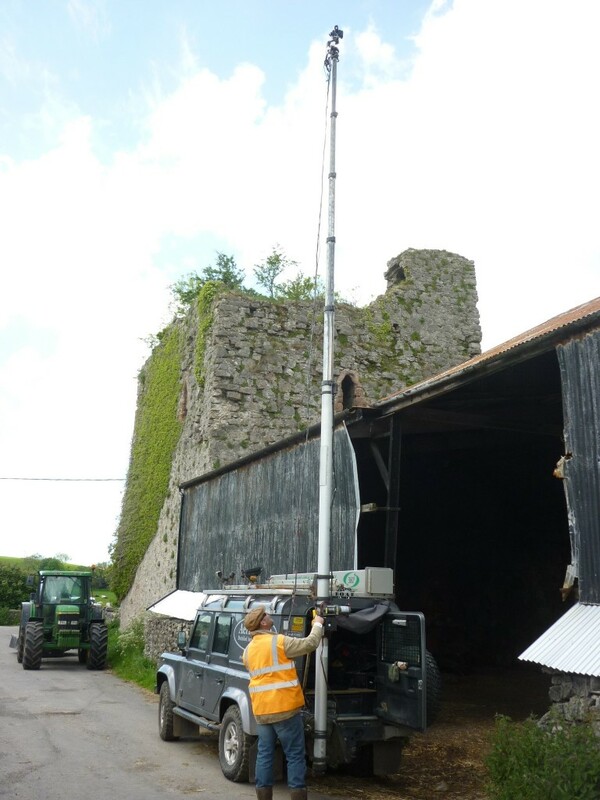 We would also like to thank the landowners who have provided us with special permission to undertake this survey work and the team from Historic England and Cumbria County Councils Lead Archaeological Advisor who have provided advice and guidance along the way. It is hoped that the work undertaken so far will be built on in future years with additional survey and assessment, finding positive solutions to protect this rare and fascinating site.